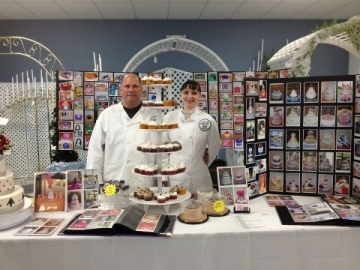 Hello and welcome to Margo Smith's Cake Creations, home of the best cakes in Goldsboro, North Carolina! We are inspected by the North Carolina Department of Agriculture and the USDA. Feel free to look around at the amazing pictures and enjoy your stay! 01/21/2017 - Three years have gone by since we put a solid news update here! Most of our day to day information and discourse takes place on our facebook page now, which can be found here. We've been in business now almost 8 years and hope to continue serving you all! 02/05/2014 - Hey everyone! We are still alive and doing very well! The business is booming, and we thank you all for your continued support. 06/02/2013 - It's been a busy year so far for us! Business is still crazy. We thank everyone for their continued support. Make sure to get any cake orders you want in early to ensure proper delivery time! 09/12/2012 - Summer is starting to draw to a close and the cold weather is moving in. You know what that means! Wedding season part two! Make sure to get your orders in early to ensure that there is room. Also, take a look at our galleries! Images from the last several months have been caught up on. As always, thank you for your continued support! 05/22/2012 - Wedding and graduation season are moving along and orders are piling up! Thank you all for your continued support. Make sure to get your orders in early, and check out our testimonal from the Anna Darlene Flannery Firefighter Memorial Scholarship Board, located in Kentucky! 11/24/2011 - The holiday season is fast approaching and orders are coming in fast. If you want a cake, try to get your order in as soon as possible! We also now offer cake pops. These delicious round cake bites on a stick will make the perfect treats for your holiday celebration or any celebration. Choose from fantastic toppings such as peppermint, reese's pieces, and much more! 07/24/2011 - A very beautiful and elaborate testimony was recieved a few days ago and has been posted to the top of the testimonials section. It is with great pride that we provide the community with the exceptional quality that we do. 06/03/2011 - Wedding season is in full swing. Thanks for all your continued business and support. Check out all the newest photos of wedding cakes as well. 05/08/2011 - We've uploaded a bunch of new photos to the site and have updated a few things here and there. Weddings are packed for the next couple of months, so if you have orders, call them in as soon as possible! 03/03/2011 - Thank you all for your continued support! Business is still growing and we have you all to thank for that. Take a look at some of our newest cakes in the back of the galleries! 11/04/2010 - Testimonials are rolling in as well as orders. Get your Holiday orders in now as we are booking up fast. Thank you for your continued support! 09/18/2010 - Plenty of orders rolling in and new pictures still being added! Have you ordered from us and want to leave feedback? Check out the testimonials page! 08/19/2010 - The website is finally up and running! More pictures are being added daily, so keep coming back!